AMMONNEWS - By Brian Frydenborg - If white Americans and Israeli Jews want African-Americans and Palestinians to cease with the ruckus, they must make their own societies and governments cease systematically bringing the ruckus to these darker-skinned neighbors of theirs. It is times like these when we are reminded how thin our veneer of civilization truly is, how frail the social fabric that binds us together is, how easily it can all come undone. We did not see this after 9/11 in New York: New Yorkers united to help each other, did not panic. But we did see this after Hurricane Katrina and gross incompetence from everyone from Mayor Ray Nagin to President George W. Bush devastated New Orleans. It was not some sort of freak coincidence that people both in America and the Middle East, as well as elsewhere, looked at images coming out of Ferguson and images coming out of Egypt, the Palestinian Territories of Gaza and the West Bank, and other places in the region and saw significant similarities. 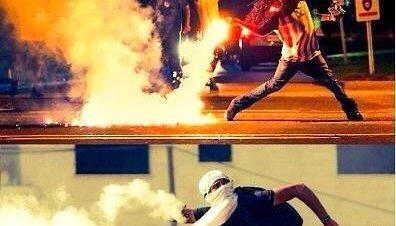 The imagers of mass protests turning violent and/or security forces’ violent responses, often involving tear gas, were, at times, difficult to tell if they were taken in Ferguson or Ramallah or Cairo. Some in in the Middle East, far more accustomed to dealing with tear gas than Americans, posted advice for their fellow protesters in America. There was a genuine solidarity felt between protesters in both regions. For many, especially white Americans and Jewish Israelis, this might seem incomprehensible. What could African-Americans and Palestinians have in common with each other? There was a genuine solidarity felt between protesters in both regions. Well, despite all the differences, quite a lot actually. America in particular can very much look at the situation in Israel/Palestine as a cautionary tale. And the sad reality of all of this is that this whole incident of young Michael Brown being killed by Officer Darren Wilson in Ferguson, Missouri, and its aftermath is but one single brick in a Berlin Wall of America’s racial divide, separating not East and West Berlin, but most American whites from most American blacks and many other people of color. Or, if you will, a brick in the Israeli Separation Barrier of America’s racial divide might be a more apt metaphor. The Berlin Wall separated white Berliners from other White Berliners. But, like America’s invisible wall, Israel’s physical wall is based on race/ethnicity, separating Arab Palestinians from Israeli Jews. I will not claim here that slave-descent African Americans in America are the equivalent of Palestinians in the West Bank and Gaza. But there are important similarities between the recent violence in Ferguson and current violence in Jerusalem, between historical unrest in America among blacks and historical unrest among Palestinians under Israeli control, that are worth exploring. Unless you are a more recent voluntary immigrant from Africa or the Caribbean (and they generally were not allowed until relatively recently but have, as groups, been more successful than slave-descent African-Americans), if you have black skin your ancestors were almost certainly brought over here in chains as slaves, bartered for and sold as human chattel, bred like animals, and tortured, sexually abused, and raped at will by their masters for generations. Through colonial and pre-Civil War American history, there are sporadic slave rebellions, but most of these are relatively minor affairs compared with events in Haiti and ancient Rome; there was no American Toussaint L'Ouverture or Spartacus. Unless you are a more recent voluntary immigrant from Africa or the Caribbean, if you have black skin your ancestors were almost certainly brought over here in chains as slaves, bartered for and sold as human chattel, bred like animals, and tortured, sexually abused, and raped at will by their masters for generations. Then, the election in November of 1860 of Abraham Lincoln as president by the American people to limit the spread of slavery into the West was met by preemptive secession, the seizing of federal property by Southern militias, and then attack on Ft. Sumter in Charleston, SC. In the ensuing war caused by the disagreements over the institution of slavery, Lincoln even at his inauguration gave Southerners and Southern states an open invitation to rejoin the Union peaceably and cease rebellion (including in the Emancipation Proclamation) while preserving slavery, and later offered compensation repeatedly for their slaves in an effort towards gradual emancipation even as the American soldiers, government, and people—not least of all President Lincoln—increasingly moved towards abolition and emancipation throughout the war; the South refused the offers every time. In Reconstruction governments set up in the Southern states starting in 1863 and lasting until 1877, former slaves that were liberated throughout the course of the war and eventually by the Thirteenth Amendment in 1865, just months before the assassination of Lincoln, began to assert their freedom and participate fully in government; they were elected as U.S. Senators, U.S. Congressmen, state senators and representatives, and included a governor. Many southern whites bitterly opposed these changes. In particular, they felt that freed slaves, who had nothing and very little education, should get no assistance from the federal government, and sought to undermine the Freedmen’s Bureau, something of a precursor to a modern welfare state and/or development agency, supported by the federal troops in the region. The arguments of this era quickly evolved to say the freed blacks were lazy and undeserving of any assistance, that being free meant they should stand on their own, and that the Freedmen’s Bureau and the new postwar order amounted to taking money from the hard-working white man and giving it to lazy blacks so that the Republican-dominated government could corruptly buy votes among the freed slaves. From 1865 forward, much of this has formed the core of conservative Americans’ arguments against things like welfare and affirmative action. With the Ku Klux Klan (KKK) in the vanguard, the new order, severely undermined by Lincoln’s post-assassination replacement, Andrew Johnson, was overthrown by a white supremacist terrorist and guerrilla insurgency in every Reconstruction southern state by the end of 1877. Violence overcame order and Black Codes were established, ushering in the Jim Crow era in the South, an era of legal tyranny, terror, violence, deprivation, and discrimination, of the lynching of thousands of blacks and their allies, and of mass incarceration and virtual slave labor, of being denied the right to vote, and of being kept on the bottom rung of society and denied advancement as a group while the much of rest of America had opportunities to experience social mobility and passed on wealth from generation to generation, an era that would not formally end until the passage of the Voting Rights Act in 1965, after years of tumult and the need to deploy federalized troops, again, to prevent Southern whites from continuing their reign of terror over blacks. This era gave way to the Vietnam era, which combined with the Civil Rights Movement, would see many violent riots, the assassination of JFK, MLK, and Bobby Kennedy, and a severe strain on the American social fabric. Even today, there is still a lot of discrimination even if legal segregation and regular KKK attacks are a thing of the past. That we currently have a man with black skin in the White House, whose mother raised him alone and was white, and whose father was Kenyan, is not a reflection of any kind of change or progress for slave-descent African-Americans. In fact, in almost every conceivable way black Americans have a far inferior existence in America compared to whites, so that, if separated, their socio-economic statistics would be like that of a fragile, “third-world” state by the standards of the Fund for Peace. And the links to the past are undeniable: in American counties where slavery existed in higher proportions, today there is greater inequality, so there is an exceedingly good case that not only has a vast, centuries-long injustice been perpetrated upon these people, but that they are entitled to compensation for the crimes a whole nation has inflicted upon them. In fact, in almost every conceivable way black Americans have a far inferior existence in America compared to whites, so that, if separated, their socio-economic statistics would be like that of a fragile, “third-world” state by the standards of the Fund for Peace. And the links to the past are undeniable: in American counties where slavery existed in higher proportions, today there is greater inequality, so there is an exceedingly good case that not only has a vast, centuries-long injustice been perpetrated upon these people, but that they are entitled to compensation for the crimes a whole nation has inflicted upon them. If we look at the conflict with Israel and Palestinians in Israel, the West Bank, and Gaza, it is both vastly different and one which is hauntingly familiar. While the enslavement of blacks by Americans goes back to the early seventeenth century, the conflict between Arabs and Jews in what is today known as Israel and Palestine (West Bank and the Gaza Strip) only dates to the late nineteenth century, when mainly European Zionist Jews began settling the area, then under the control of the Ottoman Empire. At the beginning of WWI, before the British Empire conquered Palestine from the Ottoman Turks, even after several waves of Jewish immigration there were roughly only 60,000 Jews to 81,000 Christians, 650,000 Muslims, and 7,000 Druze; Jews were only about 7.5% of the population of Ottoman Palestine. At the beginning of WWI, before the British Empire conquered Palestine from the Ottoman Turks, even after several waves of Jewish immigration there were roughly only 60,000 Jews to 81,000 Christians, 650,000 Muslims, and 7,000 Druze; Jews were only about 7.5% of the population of Ottoman Palestine, though tens of thousands of Arabs and some Jews left or were forced out during the war, shifting the balance of Jews to almost 7.9% in 1918. True, a significant number of these were the community of Jews who had survived the Roman wars and expulsions of the first and second-centuries C.E., but they were always a small minority from not long after that period forward. Yet in the years from the end of WWI until 1948, though, the British, committed to providing a “national home” for the “Jewish people” in Palestine with the Balfour Declaration and through general a policy of allowing large-scale immigration of Jews into Palestine, ended up shifting this balance during the course of the their Mandate so that by the time major fighting broke out late in 1947 in the civil war between Jews and Arabs and in the later 1948-1949 war that a brand new Israel fought against its Arab neighbors, there were 650,000 Jews to 1.2 to 1.3 million Palestinian Arabs; under the British, the Jewish population had easily more than quadrupled its proportion and grown more than eleven times in absolute terms. The majority Palestinians had never consented to Jewish immigration, let alone allowing a sovereign Jewish state to be created by British Europeans and mainly European Jews on land in which they had been the majority population for many centuries, though as a community, they and their neighboring non-Palestinian Arab brethren never came close to the cohesion, organization, efficiency, and planning of the Zionists, nor did they in general in any subsequent war, conflict, or intifada, up through and including the latest lopsided encounter in Gaza in the summer of 2014. Their leadership decimated by a failed revolt against British rule in Palestine in the 1930s, the Palestinian Arabs were a mess when the British, exhausted emotionally and materially from WWII and facing Jewish terrorism in Palestine, announced their decision to leave and transfer responsibility to the fledgling United Nations. In the ensuing conflict, Israel established a state, but some 700,000 Arabs fled because of direct expulsion at the hands of Jewish forces, direct or indirect pressure from Jews, voluntarily, or with encouragement from fellow Arabs. Roughly one-third fled outside what is now known as Israel, the Gaza Strip, or the West Bank, but the rest ended up as refugees in the latter two, joining the Palestinians who were already living there. Israel took both Gaza and the West Bank over in the 1967 Six-Day War, and from 1967 until today, Israel has maintained its military rule of the West Bank, and as of now we are approaching 400,000 Jewish colonists, or settlers, living in settlements established after 1967 in the West Bank, excluding East Jerusalem, which was also occupied in 1967 and which Israel completely controls today. The nearly 400,000 settler-community, whose population has dramatically increased in recent decades, live among at least 2.5 million Palestinians. Despite previous agreements, all Palestinians living in the West Bank are totally subject to the authority of the Israeli Defense Forces (IDF, or Israeli military), though when Israel permits some parts of the West Bank are subject to varying degrees of partial local control. Israel’s policies also greatly weaken the Palestinian economy. From 1967 until 2005 Israel also ruled Gaza through its military and an occupation that also saw Jewish colonization until Israel unilaterally withdrew in 2005. Hamas, the Islamist resistance and terrorist movement, took over in 2006, and since then, Israel has maintained a debilitating siege/blockade of and de facto control over Gaza, especially in terms of sovereign matters (air space, coastal waters, land borders/crossings, the Palestinian population registry, taxation, most utilities, travel rights, etc.) as I have written before. In the end, West Bank Palestinians (and Gazans until 2005) have been subject to a brutal military occupation since 1967 denying their basic rights and freedoms and, since the settler movement grew, subjecting them to a system—not wholly dissimilar from apartheid and Jim Crow if not exactly the same—that explicitly favors the Jewish settlers over them and subjects them to different standards, restriction, and laws, and also mostly fails to stop or prosecute violent crimes committed by those the system favors (Jews) against those the system does not (Palestinians). In the end, West Bank Palestinians (and Gazans until 2005) have been subject to a brutal military occupation since 1967 denying their basic rights and freedoms and, since the settler movement grew, subjecting them to a system—not wholly dissimilar from apartheid and Jim Crow if not exactly the same—that explicitly favors the Jewish settlers over them and subjects them to different standards, restriction, and laws, and also mostly fails to stop or prosecute violent crimes committed by those the system favors (Jews) against those the system does not (Palestinians). And even Palestinian-Israelis (also called Israeli-Arabs) with Israeli citizenship and living in Israel are subject to systematic and routine discrimination even though they are not living under a military occupation or siege. So Palestinians were not brought over in chains like African-Americans and have not been subject to slavery. But on a day-to-day basis, Palestinians do occupy the bottom rung in the social and political system set up by the Israeli state, working low-skilled and labor-intensive jobs, facing all sorts of discrimination (including housing), brutality from security forces, neglect in resources, and general racism in ways a black American would find very familiar or at least somewhat similar. The structures oppressing Palestinians under Israeli control are massive and overwhelming, and experiencing little or no progress or even regression, Palestinians have resorted to violence to make themselves heard, to feel empowered, to let the building and boiling rage loose on a society and a world that at best plays lip service to their plight. How is this any different than what happened in Ferguson? How can any aware, caring, empathetic person not see the disturbances and realize that it is in part the primal, rage-filled scream of a people who have been shackled, trampled-upon, cast aside and ignored? Surrounded by a majority culture that stigmatizes and fears them, teases them by surrounding their ghettos and enclaves with and overwhelmingly higher standard of living and lifestyle that mocks them with a sight of the opportunities and privileges they might have known, forces them to choke on generations of deprivation and inequality, and treats them in an inferior way in almost every possible way, so that even young black kids unconsciously negatively associate the “bad” with black skin and the “good” with white skin, would not any people explode with such rage after decades of regression and being ignored, and would not some of this rage inevitably devolve into violence? Surrounded by a majority culture that stigmatizes and fears them, teases them by surrounding their ghettos and enclaves with and overwhelmingly higher standard of living and lifestyle that mocks them with a sight of the opportunities and privileges they might have known, forces them to choke on generations of deprivation and inequality, and treats them in an inferior way in almost every possible way, would not any people explode with such rage after decades of regression and being ignored, and would not some of this rage inevitably devolve into violence? Sure, some can argue that that was a lot of media attention and people projecting symbolism onto a specific event. But people projected onto the Dredd Scott decision, on John Brown’s violent raid, on the Rosa Parks bus incident, on Rodney King’s incident. Many white Americans projected their concerns onto Darren Wilson’s situations just as many blacks projected their grievances onto Michael Brown’s death. Tunisians projected theirs onto a single fruit vendor self-immolating; Israelis projected when three Israeli teens—Naftali Fraenkel, Gilad Shaar, and Eyal Yifrach—were kidnapped and murdered in cold blood and Palestinians projected when Muhammad Abu Khdeir was burned alive and murdered in turn. In fact, on both sides of the Israeli-Palestinian conflict it very common for funerals to turn into political rallies or protests, with Israelis and Palestinians projecting vociferously against each other and using the funerals as a platform to do so. This is human nature and common in any conflict. Regardless of whether or not the media chose to focus on the events in Ferguson, the grievances, emotions, and rage are all very real, just as the brutality of the Israeli occupation of the West Bank would be there whether or not it was in the media spotlight. Israelis will project their insecurity of living in a relatively new state with neighbors that have not signed a peace treaty with them and with terrorist groups that say they want to destroy them, and Palestinians will project their rage at a decades-old occupation, serial abuse, and continuous theft of their land carried out by the Israeli government. And black Americans will project their frustrations on a society that has never treated them justly and ignores them as their conditions worsen. Furthermore, it is particularly hypocritical, as I noted in one of my recent podcasts, that so many white, conservative Americans hold the belief that weapons in the hands of the individual citizen, a bearing of arms which they erroneously believe is an individual and unrestricted right guaranteed by the Second Amendment to the U.S. Constitution, provide an appropriate threat of violence that is a perfectly fine check on the federal government’s authority but at the same time are so strongly disapproving of and unsympathetic to the protests and violence of a frustrated black community, frustrated by what they see as regular abuse of government authority in the wake of incidents like those in Ferguson and when Eric Garner was accidentally choked to death in Staten Island by a police officer in the process of being arrested for merely selling cigarettes illegally, among many other similar incidents. And let’s be clear: both black Americans and Palestinians are in conflict with state systems that do not hear their causes, do not address their conditions or concerns, and do not generally represent them. When a Palestinian looks at Israeli security personnel, they do not see public servants there to protect them, but instead see a tool of oppression, and it is the same with many black Americans looking at their local police. And, historically, in both conflicts the security forces were used very directly by the state as tools of oppression against both peoples; they still are today, and one only has check the news to confirm this. Let’s be clear: both black Americans and Palestinians are in conflict with state systems that do not hear their causes, do not address their conditions or concerns, and do not generally represent them. We cannot endorse rioting in American streets or killing Israeli Jews in their synagogues, attacks targeting American police officers or Israeli civilians (anyone who wants to can see my harsh condemnation of Hamas right here or hear my denunciation of recent attacks against police here). But neither can we endorse a state and society-perpetuated assault on black Americans, their opportunities, and their chance at equal justice that has mostly strengthened their unequal status in all facets of American life. Nor can we endorse an Israeli occupation that ignores the basic human rights of Palestinians, steals their land, and whose existence is based solely on brute force without any acceptance by those it occupies. Americans and Israelis should be concerned about the physical violence they have seen; if they want to address it in the long run, they must end their structural violence of assault and occupation, respectively. Because to not do so is to simply encourage violence on the part of peoples whose respective systems leave little alternative. The violence is not the problem, it is a symptom, for people do not generally resort to violence when the system they live under is responsive to their needs. America’s system is not responsive to black Americans and has not been for centuries, and Israel’s system is not responsive to Palestinians and has not been for decades, and this is the true problem both societies face. Of course, righting these wrongs will not totally eliminate violent behavior on the part of black Americans or Palestinians, but it would make such behavior incredibly rare. And if we white Americans do not work towards ending this structural violence? If white Americans continue to fail to understand the legitimate grievances of the black community and do nothing out of ignorance or worse? We can expect more Ferguson Intifadas, and to find more protest photos and video where it is not easy to tell the difference between America and the Middle East. The violence is not the problem, it is a symptom, for people do not generally resort to violence when the system they live under is responsive to their needs. America’s system is not responsive to black Americans and has not been for centuries, and Israel’s system is not responsive to Palestinians and has not been for decades, and this is the true problem both societies face. If you want to learn more about the Israeli-Palestinian conflict, feel free to look at my piece on this summer's Israel/Hamas Gaza conflict and its context beginning right here. so many words and such utter stupidity. "Blacks are todays Palestinians". LOL First, then they are lining up with the most pathetic and degenerate culture to emerge in the civilized world. Violence is the core problem. Violence causes poverty, not the other way around.